The right tool makes any job easier. Finding the right tool can be something of a pilgrimage. We are fortunate in Hilo to have Garden Exchange close at hand for bamboo splitters, hand forged pruners, and properly balanced hedge shears. For those seeking carpentry tools as well as garden supplies, sewing kits, and bonsai equipment there are several wonderful places we visited on the mainland. Friends in Phoenix, Arizona tipped us to Anzen Hardware in Los Angeles. My husband’s father ran a hardware store in Texas. Anzen Hardware was a treat to visit. 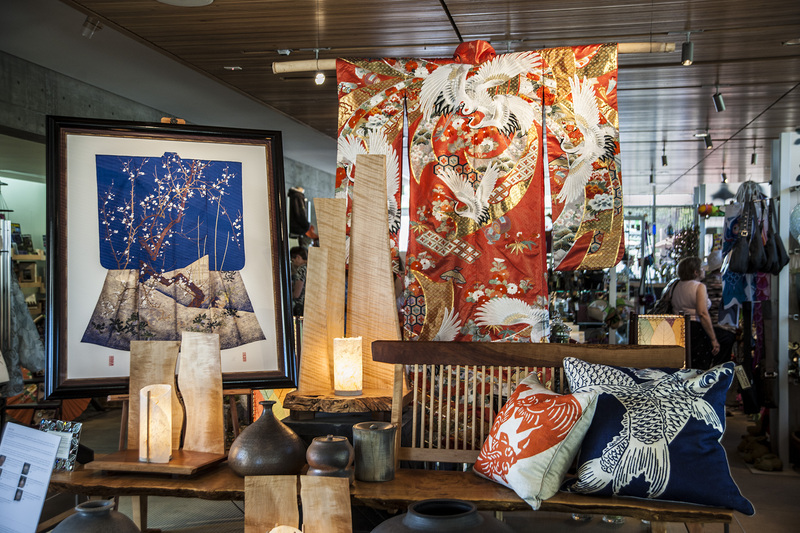 Located on East First Street near the Japanese Village Plaza Mall, Anzen Hardware is full to the rafters with wonderful goods. Chefs seek this store out for its fine selection of quality knives. Sake makers come here for their supplies. There are bamboo brooms and gravel rakes for the gardener. Fans call it an old fashioned hardware store for the handyman. Best of all is owner Nori Takitani who started as a high school part time worker in 1954. One of the elders of the community, he can be counted on for good service and advice. My favorite purchase from this store (so far) were the vegetable seed packets along with good advice from Nori to put them in the refrigerator first “to wake them up” before planting. Another seed source was the gift shop at the Japanese American National Museum a few blocks down the street. 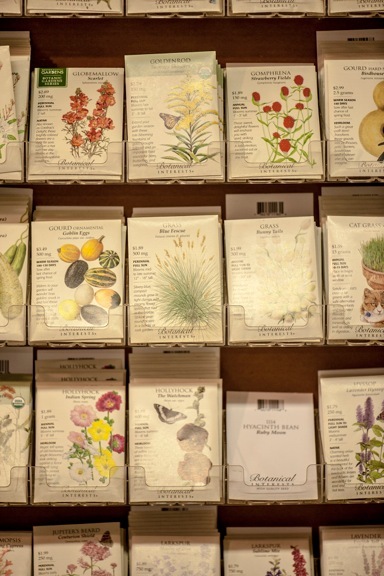 Kitazawa Seed packets and a well stocked bookcase were favorite attractions in the JANM store. 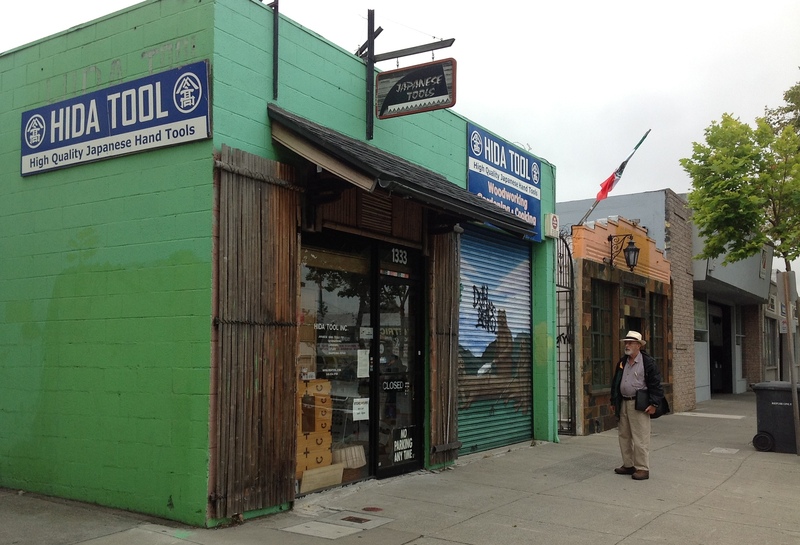 To the north is Hida Tool on San Pablo Avenue in Berkeley. Bill waits for the doors to open early one morning. Like Anzen, Hida Tool has crowded shelves, knowledgeable staff, and museum pieces on the wall. In addition to the store, Hida Tool has gone high tech with a web site. As mentioned on their site, “Hida Tool was started in response to requests from San Francisco Bay Area woodworkers to get tools like those being used by Makoto Imai, who had come from Japan in 1978 after his 5-year apprenticeship in carpentry plus 9 years as a teahouse and temple builder. His were the hand tools of the builders of traditional homes and temples in Japan, including saws with both crosscut and rip teeth on the same blade, planes with wooden bodies quite different from those of European and early American wooden planes, and both plane blades and chisels forged by methods developed by the blacksmiths who created the famous samurai swords. These tools had a layer of very hard steel forged to a larger mass of softer iron, which allowed the formation in the tempering step of a harder cutting edge than was permissible in tools made entirely of similar carbon steel. “The business was opened in San Rafel, California (north of the Golden Gate) in 1982 by Imai-san’s brother-in-law Osamu Hiroyama and Kip Mesirow, author of “Care and Use of Japanese Woodworking Tools” and former owner of a smaller Japanese tool store in Berkeley. Hida Tool Co. moved to our current location in Berkeley in the summer of 1984 with a greater variety of carpentry tools. Because of the interest in tools used for Japanese gardens, these became the second category of tools stocked. Kitchen knives, the third “specialty of the house,” also make use of the swordmakers’ technique of combining two different metals. A smaller number of other tools, etc., all imported from Japan, can be found on this website and in the store. I purchased tools for fence building and knot tying plus exquisitely balanced hedge shears, camellia oil in a spray bottle, small sewing scissors, and handkerchiefs for fellow workers. All was shipped to me by the store and arrived in good order. Wandering down the street from our hotel in San Francisco, we came upon Soko Hardware on Post Street. 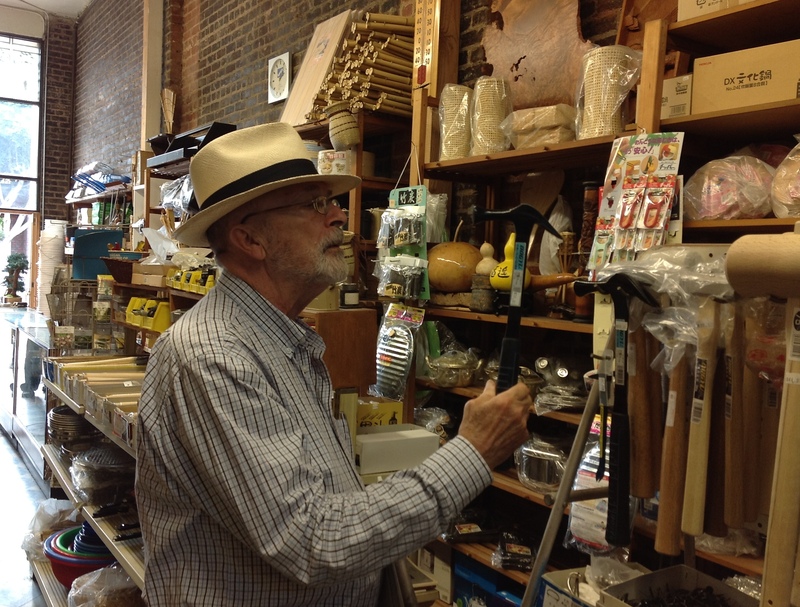 Another family-style hardware store carrying excellent culinary knives, garden supplies, woodworking tools, plus kitchen equipment, fine dishes, paper lanterns, and seeds among many other items. Owned and operated by the Ashizawa family since 1925, Soko Hardware is now under the guidance of the third generation, Roy Ashizawa. 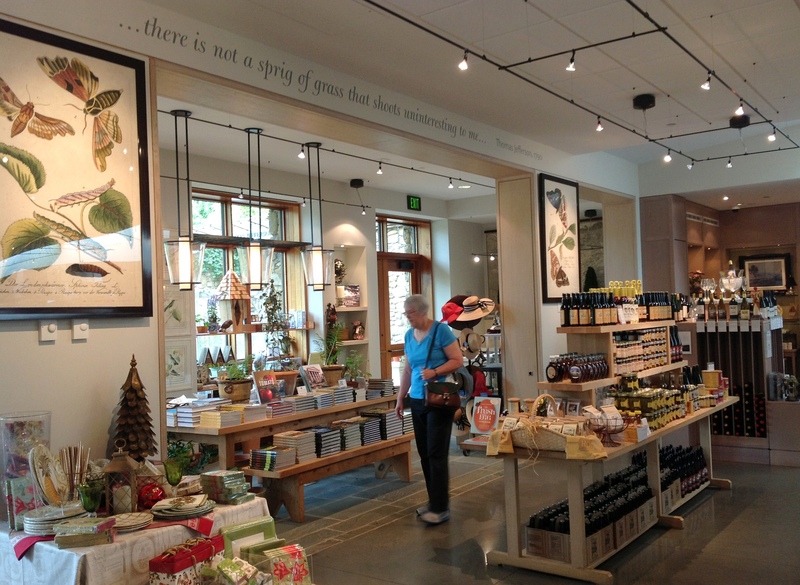 Garden and museum gift shops are another source. 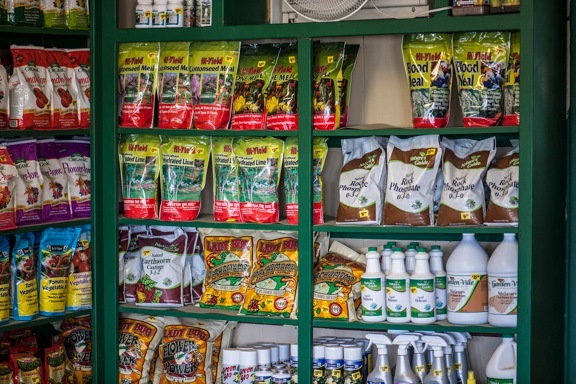 Heritage seeds from the time of Thomas Jefferson can be found in the gift shop at Monticello. “…there is not a sprig of grass that shoots uninteresting to me…” Thomas Jefferson said in a 1790 letter to his daughter. Bamboo fabric gloves were a favorite purchase from the Chicago Botanic Garden gift shop. An annual sale of bulbs got my attention in Denver. 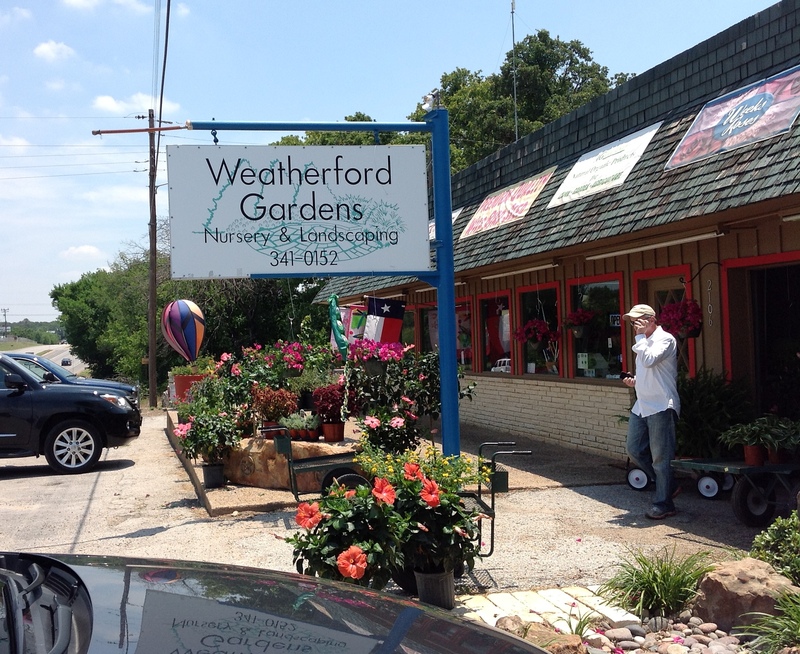 Organic products of all kinds, including seeds, were available at Weatherford Gardens just outside of Fort Worth, Texas. Where do you go to find that special thing for your garden? Comments are welcome. Be nice! All photographs appearing in this blog are the property of K.T. Cannon-Eger or Bill F. Eger. All the photography on this blog is protected by U.S. Copyright Laws, and are not to be manipulated, downloaded or reproduced any way and may not be used in commercial or political materials, advertisements, emails, products, promotions without written permission. Copyright 2013 K.T. Cannon-Eger All Rights Reserved.